The Dairy Barns Holiday Cottages01692 598243work Self-cateringDairy Barns - a family business run by the Deane family that offers award-winning Bed and Breakfast and holiday cottage accommodation situated on the edge of the picturesque villages of Hickling and Sea Palling. We’re tucked away in unspoiled Norfolk countryside, within minutes of the Broads and the Norfolk Coast. 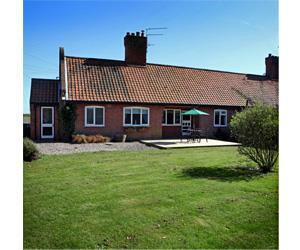 All 3 of our cottages are available to let throughout the year on a weekly or short break basis. They have been finished to a high standard and freshly decorated and furnished. The kitchen are very well equipped with more than enough crockery and utensils along with the all important dishwasher. The gardens are large and fully enclosed with a decked/patio area, ideal for the afternoon sun and a barbeque which is perfect for evenings out in the garden. We welcome dogs in Cowman's Cottage and Dune View Cottage. Willow Farm Cottage and Dune View Cottage are Semi Detached and we have a secret door under the stairs that can be unlocked to link both cottages should you wish to book them as one. If you can't survive without the internet Wi-Fi is available throughout the cottages along with the more traditional books and local information brochures. All 3 cottages have full central heating and Willow Farm Cottage has a log burner in the lounge, perfect for cosy winter evenings. Dairy Barns - a family business run by the Deane family that offers award-winning Bed and Breakfast and holiday cottage accommodation situated on the edge of the picturesque villages of Hickling and Sea Palling. Full detailed directions are available from our website.